Deep-sea anglerfish are strange and elusive creatures that are very rarely observed in their natural habitat. Fewer than half a dozen have ever been captured on film or video by deep diving research vehicles. This little angler, about 9 cm long, is named Melanocetus. It is also known as the Black Seadevil and it lives in the deep dark waters of the Monterey Canyon. MBARI's ROV Doc Ricketts observed this anglerfish for the first time at 600 m on a midwater research expedition in November 2014. We believe that this is the first video footage ever made of this species alive and at depth. Those are the adjectives most humans use when describing the female angler fish, aka. the Black Seadevil. But Monterey Bay Aquarium Research Institute (MBARI) senior scientist Bruce Robison offers a different perspective. "Beauty is in the eye of the beholder," Robison told on Friday. "I think it's beautiful. It's perfectly adapted to the habitat that it lives in and the kind of life it leads." Anglerfish, like this Melanocetus, are among the most rarely seen of all deep-sea fishes. MBARI researchers captured rare footage of this "denizen of the deep" in Monterey Canyon, almost 2,000 feet below the surface. At that depth, there's very little light. But the female angler fish is equipped with a bioluminescent fishing pole to lure food near it's jagged-toothed mouth. Fans of the animated movie "Finding Nemo" (2003) will recall that Dory and Marlin were drawn in by the glowing lightof an angler fish and almost became a meal. As The Christian Science Monitor has reported, as MBARI scientists explore depths beyond 200 meters (660 feet), there's very little light in Monterey Canyon. Many sea creatures that live at this depth are bioluminescent, which means they make their own light. With their blinking blue and green lights, many of these gelatinous (jellylike) creatures in the deep ocean look more like spaceships than animals. "When you see one, they really are more bizarre than science fiction could come up with," says Steve Haddock, marine biologist at the Monterey Bay Aquarium Research Institute (MBARI). Blue-green light is the most common. That is because these colors have a long wavelength in water and are easily spotted by sea creatures. MBARI teams have only spotted just three Seadevils in 25 years of researching the underwater canyon off the California coast. Research at these depths is conducted using remotely operated vehicles (ROV), and the latest MBARI explorer is dubbed the "Doc Ricketts." The ROV is operated by scientists aboard the MBARI vessel, the R/V Western Flyer, a 117-foot small water-plane area twin hull (SWATH) oceanographic research vessel designed and constructed for this purpose. The work of the MBARI teams is explained in a new exhibit that opens this week at the Monterey Bay Aquarium. The “Mission to the Deep” features a 360-degree video projection of the Monterey Canyon. Australia is working on new drift modelling to expand the geographical area in which wreckage from missing Malaysia Airlines flight MH370 may come ashore, the Australian search coordinator said on Wednesday. Initial analysis had suggested the first debris from the plane could come ashore at West Sumatra in Indonesia after about 123 days. “We are currently working ... to see if we can get an updated drift model for a much wider area where there might be possibilities of debris washing ashore,” the search coordinator, Peter Foley, said in Perth. 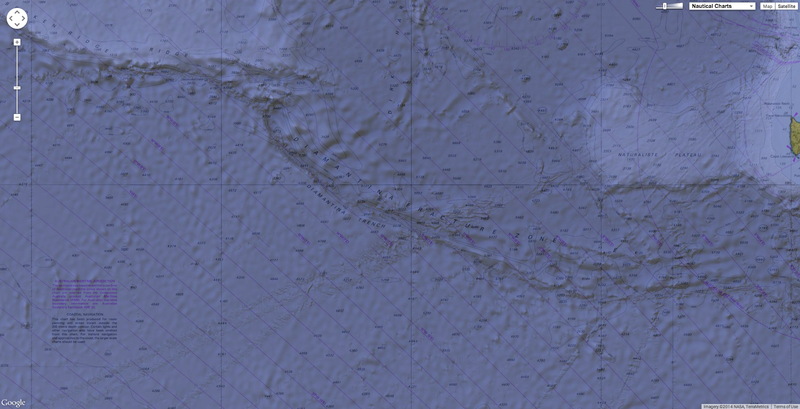 Last week, the ATSB gave an update which includes an extension of the ‘7th Arc’ search area with a drifting approach where parts may have been caught in an ocean current, bringing them ashore of Western Sumatra after 123 days. Foley said the research centre was receiving reports at least once a week of debris washed up on the Australian coastline, but none has so far been identified as coming from the missing aircraft. The drift modelling supplements an ongoing surface and underwater search for the plane, which disappeared over the remote Indian Ocean on 8 March with 239 people on board. The search for the missing Malaysia Airlines flight 370 became all the more complicated with an internal disagreement among investigators. The chief commissioner of the Australian Transport Safety Bureau (ATSB), Martin Dolan, on Tuesday dismissed suggestions there was disagreement on the search area among the five groups that make up the international team - Boeing Co in the US, Thales in France, US investigator the National Transportation Safety Board and the Australian Defence Science and Technology Organisation. The teams initially agreed an area about 600km long by 90km wide west of Perth, Western Australia, was most likely. A new report released last month specified two high-priority areas further south. “There is no disagreement, just the deliberate application of differing analysis models,” Dolan said. Representation of probability distribution at 6th (0011) arc for constrained autopilot dynamics (red) and data error optimization (green). Red flight paths are most probable paths from the two types of analysis. 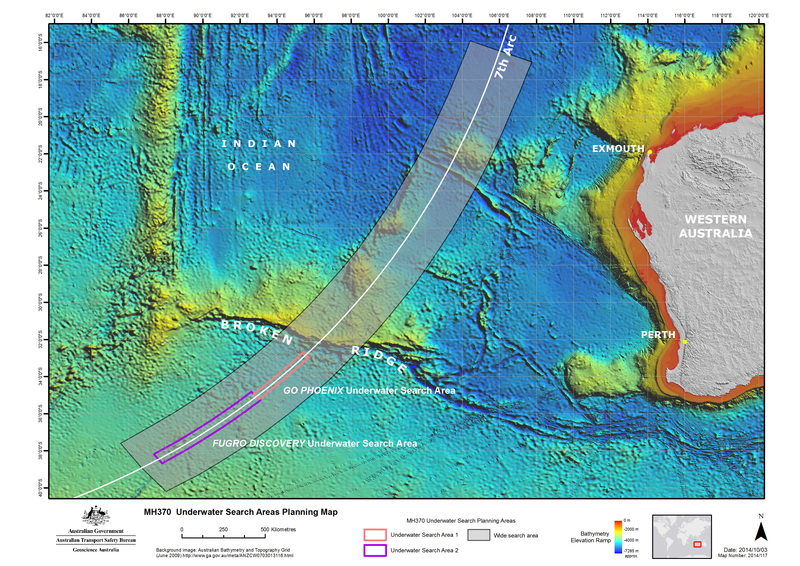 All five groups agree MH370’s final resting place is near the “seventh arc” a curve that stretches from about 1,000km off Exmouth in WA, to a point about 2,000km south-west of Perth, Dolan said. More than 6,900 sq km of sea floor has been searched so far. 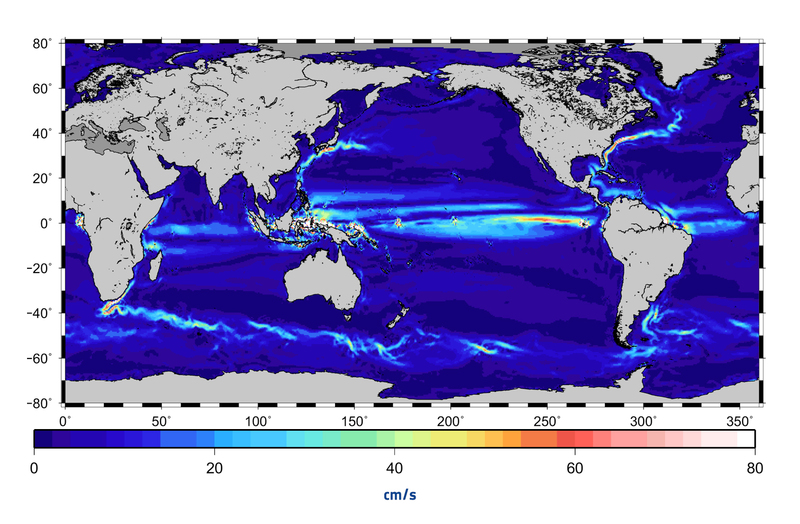 The ocean currents and their speeds (in cm/s) derived from GOCE data. During the mission’s final year, its super-low orbit was lowered even further to obtain improved measurements of Earth’s gravity field, from which information on ocean currents was derived. 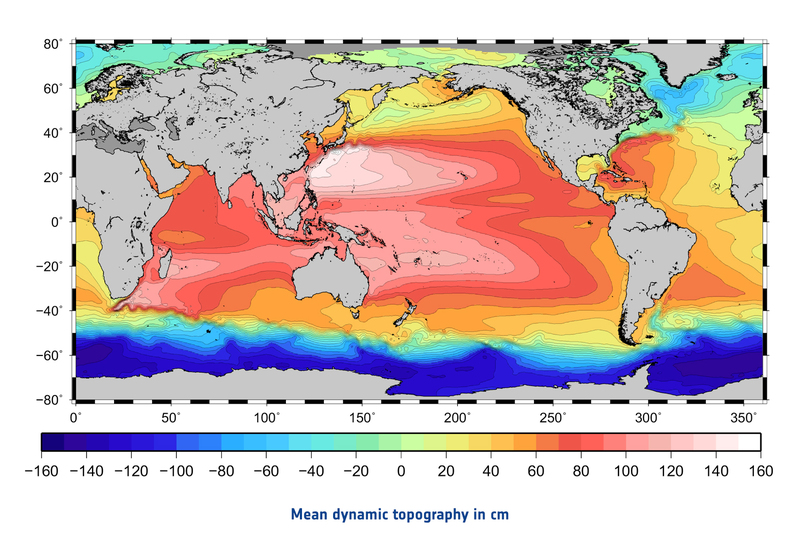 Buoys floating in the oceans were used to validate the above map, proving that this GOCE-based model is more accurate than any other model based on space-based data to date. Scientists have produced what they say is the most accurate space view yet of global ocean currents and the speed at which they move. The information has been drawn from a range of satellites, but in particular from the European Space Agency's Goce mission. This platform, which operated from 2009 to 2013, made ultra-precise measurements of Earth's gravity. It has detailed the role this force plays in driving ocean circulation. The new model - presented at a Goce conference at the Unesco HQ in Paris, France - will be of fundamental importance to climate modellers, because it is the mass movement of water that helps to transport heat around the globe. Goce carried instrumentation capable of sensing very subtle changes in Earth's gravitational tug. This pull varies ever so slightly from place to place because of the uneven distribution of mass inside the planet. The mean dynamic topography (MDT, in cm) of the world’s oceans in the highest resolution ever achieved from space-based data. MDT is calculated by taking the mean sea-surface height measured by satellites like Envisat, and subtracting the gravity model from GOCE. Red areas show where water levels are above the surface of the gravity model, while blue depicts areas where the water is below. From this, scientists calculated the speed of ocean currents. Scientists used these observations to construct what is called a "geoid", which essentially describes the "level surface" on an idealised world. It is the shape the oceans would adopt if there were no winds, no currents and no tides to disturb them. By comparing this geoid with measurements of sea-surface height made by other spacecraft, researchers can see where water has become piled up. In 2011, GOCE delivered a model of the 'geoid' pictured here. At the time, it was the most accurate ever produced. The colours in the image represent deviations in height (–100 m to +100 m) from an ideal geoid. The blue shades represent low values and the reds/yellows represent high values. A precise model of Earth's geoid is essential for deriving accurate measurements of ocean circulation, sea-level change and terrestrial ice dynamics. The geoid is also used as a reference surface from which to map the topographical features on the planet. In addition, a better understanding of variations in the gravity field will lead to a deeper understanding of Earth's interior, such as the physics and dynamics associated with volcanic activity and earthquakes. 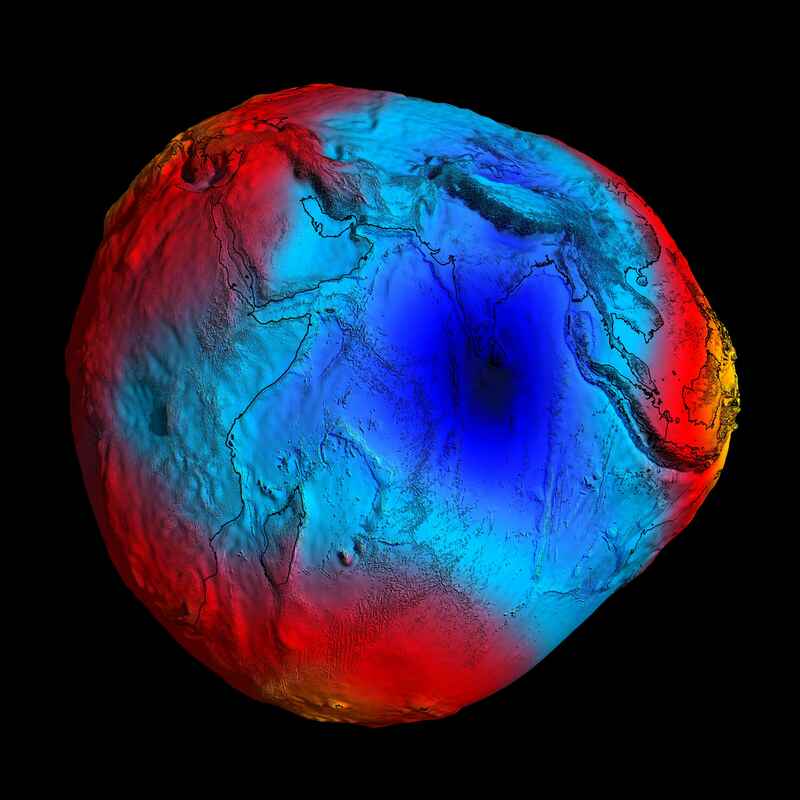 By the middle of 2014, no less than five gravity field models and corresponding geoids had been generated from GOCE's data. Each version more accurate than the last. The fifth gravity model and geoid, includes all of the gravity data collected throughout the lifetime of the mission – right up until November 2013 when the satellite finally stopped working and succumbed to the force it was designed to measure. And it is water's desire always to "run downhill" that is a major influence on the direction and speed of currents - although atmospheric winds and the Earth's rotation are of course critical partners in the overall picture. Clearly visible in the map at the top of this page are the Agulhas Current flowing down the African coast; the Gulf Stream running across the Atlantic; the Kuroshio Current that sweeps south of Japan and out into the North Pacific; as well as the Antarctic Circumpolar Current, and the system of currents that hug the Equator. In places, these great trains of water move in excess of 1m per second. The new Goce model of ocean circulation has been checked and integrated with the point measurements from drifting buoys. This has helped capture some of the smaller-scale features in the currents that lie beyond the capabilities of satellites, even one that made as highly resolved observations as the Esa mission. 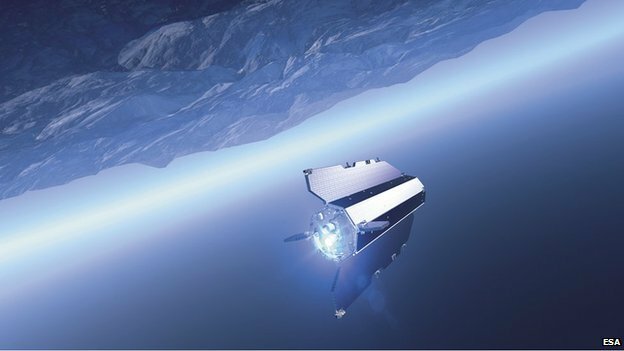 "Goce has really made a breakthrough for the estimation of ocean currents," said Marie-Helene Rio from the Italian National Research Council's Institute of Atmospheric Sciences and Climate. "The mission objective in terms of geoid [measurement] has been achieved at 1-2cm accuracy at 100km resolution, and in terms of ocean currents this translates into an error that is less than 4cm/s." Scientists can now add in data collected about sea temperature to calculate the amount of energy the oceans move around the Earth. Computer models that try to forecast future climate behaviour have to incorporate such details if they are to run more realistic simulations. Goce's sleek looks led to it being nicknamed the "Ferrari of space"
The 5th International Goce User Workshop this week will be looking at the many other applications that came out of the satellite's mission. Mapping gravity variations can yield information about ice mass loss in the Antarctic, and the deep-Earth movements that give rise to great quakes. Goce was dubbed the "Ferrari of space" because of its sleek looks and the fact that it was assembled in Italy. When operational, it was the lowest flying scientific satellite in the sky, making observations at an altitude of just 224km during its late phases. This allowed the spacecraft to better sense the tiny gravity variations, but meant it had to constantly thrust an electric engine to stay aloft. When the xenon fuel for this engine was exhausted in November 2013, Goce succumbed to the force it had been sent up to study and fell back to Earth. Eyewitnesses saw surviving debris fall into the South Atlantic, just off the tip of South America, south of the Falkland Islands. Photo of GOCE reentering the atmosphere taken by Bill Chater in the Falklands at 21:20 local time on 11 November. After more than four years mapping Earth’s gravity with unrivalled precision, the GOCE mission came to a natural end when it ran out of fuel on 21 October. The plot thickens, or should it be the ice? The most detailed and comprehensive 3D map so far of Antarctica's winter sea ice shows that big parts of it are much thicker and more smashed-up than we thought, in fact, three times as thick. Data from this map will help us fill in some of the biggest gaps in our global climate models. A preliminary 3-D map produced from multibeam sonar data collected by the AUV under an ice floe on 4 October 2012. The map shows a typical ‘lawnmower’ grid of about 150 x 150 m and the depth bar on the right shows deeper ice in red (up to about 10 m below the surface) and shallower ice in blue. The growth of Antarctic sea ice, which reached an all-time record extent this year, is one of the biggest geophysical changes that happen on Earth each year. "It expands from about four to 19 or 20 million square kilometres each year. That's more than twice the area of Australia," says Rob Massom from the Australian Antarctic Division in Hobart. "And of course this has an immense effect on the ocean surface: it caps the interaction between the atmosphere and the ocean, and it creates a white ocean surface, so affects the energy balance." Exactly how that winter ice forms – how thick it gets and by what mechanisms – has remained a mystery, leaving a big uncertainty in our current climate models. For the first time in East Antarctica (2012), climate scientists have produced a three-dimensional map of the surface beneath a sea ice floe, revealing an inverted complex topography evocative of lakes and mountain ranges. Maps revealing more winter Antarctic sea ice in recent years are based on 2D images taken from satellites. But the trouble with such data, says Guy Williams from the University of Tasmania also in Hobart, is that "we don't get thickness and so therefore we don't get total change in sea ice volume". The Autonomous Underwater Vehicle (AUV) being lowered off the stern of the Aurora Australis during SIPEX-II in 2012. The data from the AUV is used to make 3-D maps of the underside of the sea ice. Instead, Williams and colleagues used a robot submarine made by scientists at Woods Hole Oceanographic Research Institution in the US to produce detailed 3D maps of huge swathes of Antarctic sea ice. Using sonar, the submarine mapped three areas from different sides of the continent, which together make up an area equivalent to twice that of the UK (see video). A view of the Autonomous Underwater Vehicle at work under the ice. The ship's propeller is visible. "We were surprised by what we saw," says Williams. They saw ice that was much thicker than they expected, though the survey was not comprehensive enough yet to make strong conclusions about all the winter sea ice in Antarctica. 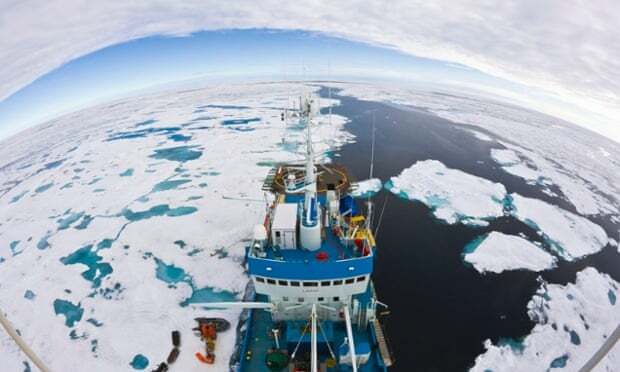 Previous estimates based on a number of very limited – and probably biased – methods like ship inspection and drilling suggested that only 20 per cent of the winter sea ice was thicker than 1 metre. This study found that 90 per cent of it is more than 1 metre thick, and indeed, 40 per cent is thicker than 3 metres. The data also hints at how the ice might form, which will be crucial for building future models. If ice were left to form on still water, it would grow to about 1 metre, says Williams. Once it gets that thick, the water underneath is insulated from the air and doesn't easily freeze. But the Antarctic sea ice is being buffeted by strong winds, which are being made even stronger by global warming. So it's getting broken up and pushed up on top of itself, making room for more ice to form. "We found that 50 per cent of the area was deformed and that was contributing to over three-quarters of the volume," says Williams. An aerial photograph taken with the high resolution digital camera in the helicopter, showing part of a survey area or ‘transect’ to the left of the ship with scientists working on the ice. The roughness of the snow cover is discernible. The ever-growing winter sea ice isn't entirely surprising. But working out which factors are driving this growth will help scientists figure out what will happen in the future. Williams says that one hypothesis was that ice formation could be driven largely by rising coastal winds breaking up the ice, allowing more to form in the gaps. People are starting to wonder if the deformation processes are changing" he says. "It's extraordinarily significant work," says Massom. "These autonomous underwater vehicles, they're giving an unprecedented view. It's almost like looking at the dark side of the moon in terms of sea ice." 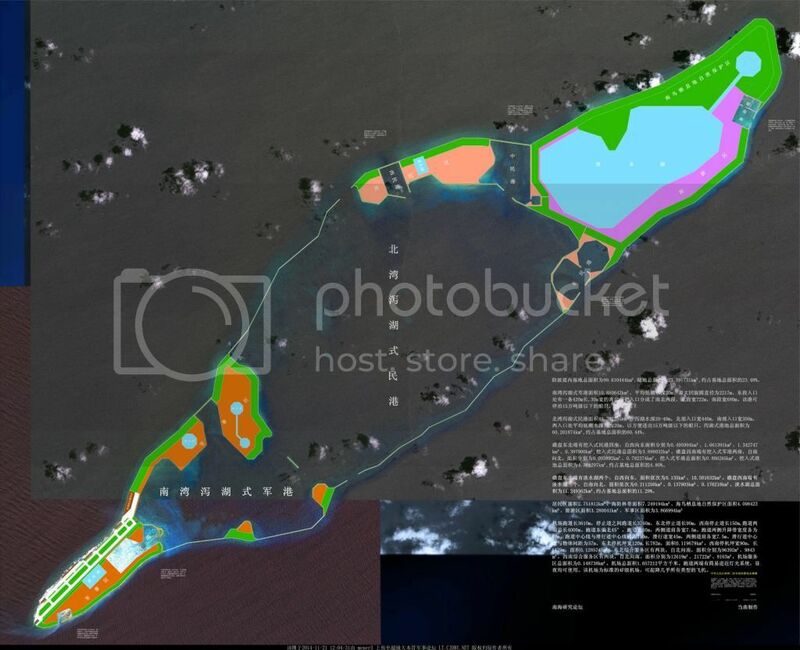 Airbus Defense and Space imagery dated 14 November 2014 shows Chinese land reclamation operations under way at Fiery Cross Reef in the South China Sea. Multiple operating dredgers provide the ability to generate terrain rapidly. Operating from a harbour area, dredgers deliver sediment via a network of piping. A major reclamation project by the Chinese government on a tiny reef 500 miles from the mainland would enable China to land military aircraft there, expanding its reach into the contested South China Sea, analysts have said. The analysts’ report came as a group affiliated with the People’s Liberation Army hosted an international conference in Beijing on Friday and Saturday intended to showcase President Xi Jinping’s call for a new regional security architecture based on the concept of Asia for Asians, an idea that minimizes the role of the United States. estimated to be 3 km in length. “Asian countries bear primary responsibility for the security of their region,” China’s vice foreign minister, Liu Zhenmin, said at the Xiangshan Forum held Friday and Saturday by the China Association for Military Science. The new IHS imagery, dated 14 November, shows now a new land mass at least 3,000 m long and 200 m wide at its narrowest point. 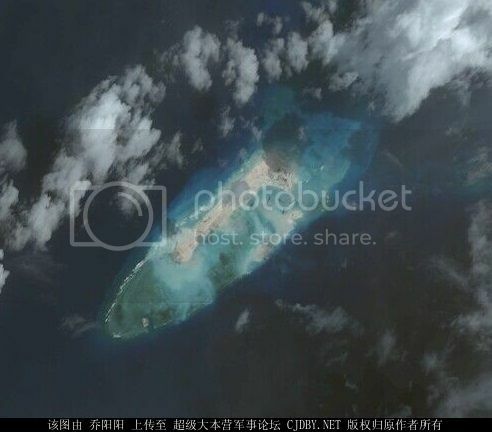 New satellite imagery reported by IHS Jane’s on Thursday showed construction of a new island about 9,850 feet long and 985 feet wide at Fiery Cross Reef in the Spratly Islands. The new island would be capable of supporting a runway and apron, the security group said. Dredgers were also creating a harbor that would be large enough to dock warships, Jane’s said in its report. AIS satellite tracking of the dredger Tian Jing Hao in the South China Sea shows it has been moving between reefs in the Spratly islands since September 2013. China has been expanding its footprint in the Spratly archipelago for much of this year by moving sand onto reefs and shoals and creating at least three new islands that could serve as bases for Chinese surveillance and as resupply stations for navy vessels, according to Jane’s. But the report said the dredging operations at Fiery Cross were by far the largest, and were intended to coerce other claimant countries in the archipelago, which include Vietnam and the Philippines, to eventually relinquish their possessions. In the Beijing forum’s keynote address, China’s defense minister, Gen. Chang Wanquan, who rarely speaks in public, said that China wanted countries to “transcend Cold War thinking,” a reference to the American alliances in the Asia-Pacific region that China contends are used as a containment strategy. Mr. Chang’s speech did not entirely exclude the United States. In recognition of the recent accord between Mr. Xi and President Obama for increased consultation between the American and Chinese militaries, he said China wanted to strengthen procedures for coping with crises. The participants included Western security experts and some defense attachés, including from the United States, but top officials from the Obama administration declined invitations to attend. In an address to the forum, Gary Roughead, a retired admiral and former United States chief of naval operations, pointedly asked China to clarify its claims in the South China Sea, and to ensure that the claims were compatible with international laws allowing freedom of navigation. China claims about 90 percent of the South China Sea, one of the world’s busiest trading routes, based on a line drawn after World War II that covers waters south of China, around Malaysia, and north to the Philippines. Other countries do not recognize the U-shaped line, which encompasses the Spratlys and Fiery Cross Reef. The plans for an airstrip at Fiery Cross Reef were most likely intended for China to land military aircraft that could monitor an air defense identification zone, known as an ADIZ, that China appears likely to create in the future, said Bonnie S. Glaser, senior adviser for Asia at the Center for Strategic and International Studies in Washington. Countries establish such zones to identify, monitor and possibly take military action against aircraft entering the designated area. In November of last year, China unilaterally announced such a zone over a vast area of the East China Sea, including the airspace over islands that are at the center of a dispute with Japan. Western officials have debated whether China would soon make a similar announcement concerning the South China Sea. Most analysts agree that China is unlikely to do so in the immediate future. But they say China is making preparations — like expanding tiny reefs into islands that can support large buildings and surveillance equipment — for the time when its navy and air force have the capacity to enforce an air identification zone far afield from the mainland. To try to stop China from continuing its land reclamation in the Spratlys, the Obama administration suggested earlier this year that all countries with claims in the South China Sea freeze their building on disputed islands. The construction at Fiery Cross Reef was an example of Chinese defiance of the American freeze proposal, Ms. Glaser said. The Spratlys comprise hundreds of reefs, rocks, sandbars and tiny atolls spread over 160,000 square miles, in an area that is closer to the Philippines, Vietnam and Malaysia than China. Several governments have claims to islands in the Spratlys, and of those, Brunei and China are the only claimants without airstrips, said M. Taylor Fravel, associate professor of political science at the Massachusetts Institute of Technology, who also attended the Beijing conference. The new satellite images suggested, he said, that China’s airstrip on the expanded Fiery Cross Reef would be capable of taking more sophisticated aircraft than the airstrip on the Spratlys island occupied by the Philippines. That airstrip, he said, can only take propeller aircraft. Jane’s said there was little doubt about the reason for the work at Fiery Cross. The international body in charge of sea safety adopted measures on Friday to protect people and the environment during a predicted shipping rush in the Arctic. But environment groups and insurers said the International Maritime Organisation (IMO) Maritime Safety Committee had failed to address key issues including a proposed ban on heavy fuel oil and how to safeguard against cowboy operators. The committee, which met in London this week, signed off on the Polar Code and various amendments to the Safety of Life at Sea (Solas) convention. These changes, which include mandatory requirements for ship design, crew training and search and rescue protocols, are expected to be ratified by the full IMO next year and come into force in 2017. Melting sea ice due to global warming and pressure to cut costs makes the Arctic commercially enticing to shipping companies who want to avoid the circuitous, pirate-ridden voyage from China to Europe via the Suez Canal. Tourism, fishing and fossil fuel operations are also looking toward one of the world’s most fragile and extreme environments. As more ships navigate the Northern Sea Route the likelihood of something going wrong in such a fragile and extreme environment increases. He says this increases the likelihood of something going wrong in a region where there is currently very little capability to respond in either a search and rescue or environmental clean-up capacity. Just four ships navigated the Northern Sea Route over Russia in 2010, but by 2013 the number had reached 71. This summer saw relatively heavy ice cover in the Arctic, causing numbers to drop. But the long-term trend is towards greatly expanded shipping across the northern extremes of Russia, Canada and even straight across the North Pole. According to insurer Allianz, Russia predicts a 30-fold increase in shipping by 2020 and an ice-free Northern Sea Route by 2050. China has suggested that by 2020, 5-15% of its trade value - close to $500bn - could pass through the Arctic. Sven Gerhard, head of hull and marine liabilities for Allianz said these predictions may be exagerrated. But there are going to be more shipping accidents in the Arctic. The new Polar Code will require ships to develop a Polar Operations Manual (POM) for each voyage, which is then reviewed and approved within the flag state. But cutting corners is tempting as the costs of ice-strengthening ships and training expert ice navigators are very large. There are some flag states insurers will not work with because they are seen as reckless. “The safety net is only as good as the POM and the POM is only as good as how it is enforced by the flag state. There are many who have both eyes closed,” said Gerhard. “It’s good to have a framework,” said WWF marine manager Simon Walmsley. “But how can you guarantee that those rules are adhered to? Without ever having sailed together before, Ryan Breymaier and Pepe Ribes crossed the Atlantic Ocean in a 60-foot monohull, one of five boats in the June 2014, IMOCA Ocean Masters New York to Barcelona race. Video of the New York-Barcelona IMOCA Ocean Masters race from reporter, Chris Museler, who was 'embedded' aboard Hugo Boss with American sailor Ryan Breymaier and solo sailor Pepe Ribes - who both teamed up for the double-handed race : really caught the feeling of the race and what it takes. The Ocean Masters founder, Sir Keith Mills, authorized a reporter to chronicle the race from aboard the boats.Only three of the five participating boats agreed to offer a spot. Ryan Breymaier is hardly known outside the national sailing community. In the port cities Barcelona and Les Sables-d’Olonne, France, he is recognized as a skipper of some of the most challenging racing sailboats in the world. Breymaier’s training and ambitions are aimed at the Vendée Globe, a solo, nonstop, round-the-world race held every four years. He is the first American in a generation to be considered a threat to the French stranglehold on that race and on the Barcelona World Race, the nonstop double-handed race on the same track. Pepe Ribes of Spain, a decorated America’s Cup and ocean-racing sailor, shares Breymaier’s ambitions. In June, Breymaier and Ribes took major steps toward fulfilling their solo sailing hopes by winning the International Monohull Open Class Association Ocean Masters New York to Barcelona Race. An unlikely match, the two were thrown together on a boat that was purchased only months before. On the delivery to New York from Europe, the mast broke; the two sailors wound up waiting until the start of the race to work together as a double-handed team. They proceeded to cross the Atlantic Ocean on a 60-foot monohull, one of five boats in the competition. “We wound up racing hundreds of 15-minute races all the way across, with each one putting more pressure on us,” Ribes said. Conditions in the New York to Barcelona Race included drifting, 40-knot winds and breaking waves. Only three of the five starters finished the race.